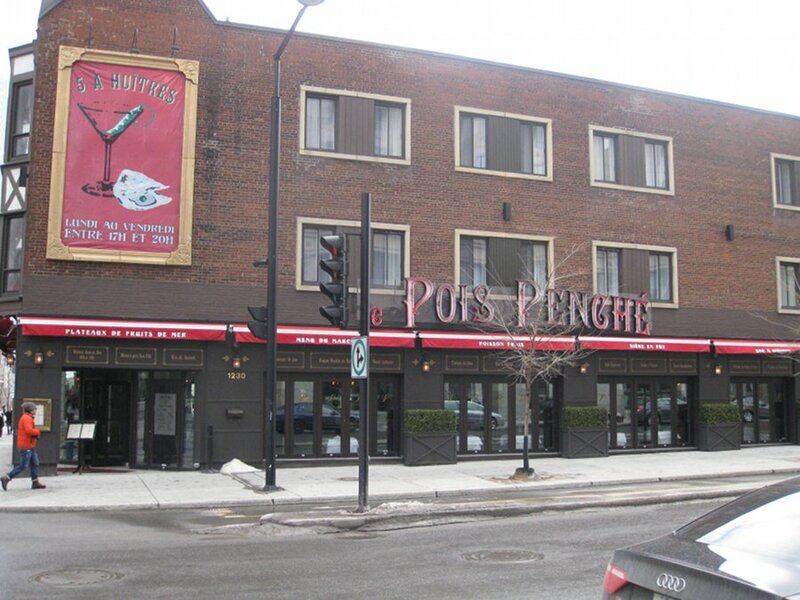 If you haven’t been to Le Pois Penché, it can best be described as a large restaurant with a seafood inspired menu meets Parisian brasserie. Once you step in you are impressed by its style and the place does not spare any expense in the initial décor (although some stuff needs to freshened up). 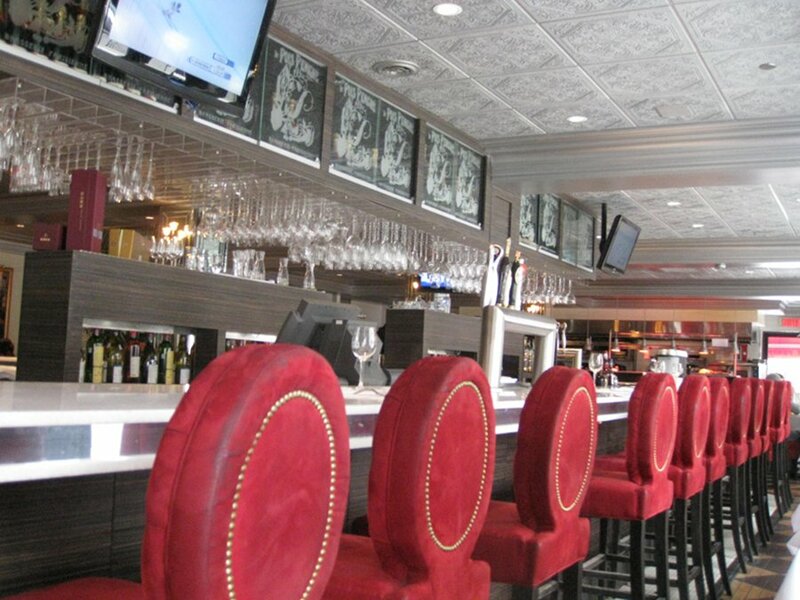 There’s lots of available seating and its good for a large group or a special occasion. There is ample seating separated by a large bar that splits the north and south side of the restaurant and in the summer there is also a large terrace outside that also shares part of the sidewalk. They also have music piped in giving it that French café feeling you see in movies. We opened up our meal with some of that nice complimentary baguette bread toasted and two types of jams, one was almond, the other berry. This was a nice touch and they offer to bring some extra bread when we were done which was kind of nice, and added value to the meal. 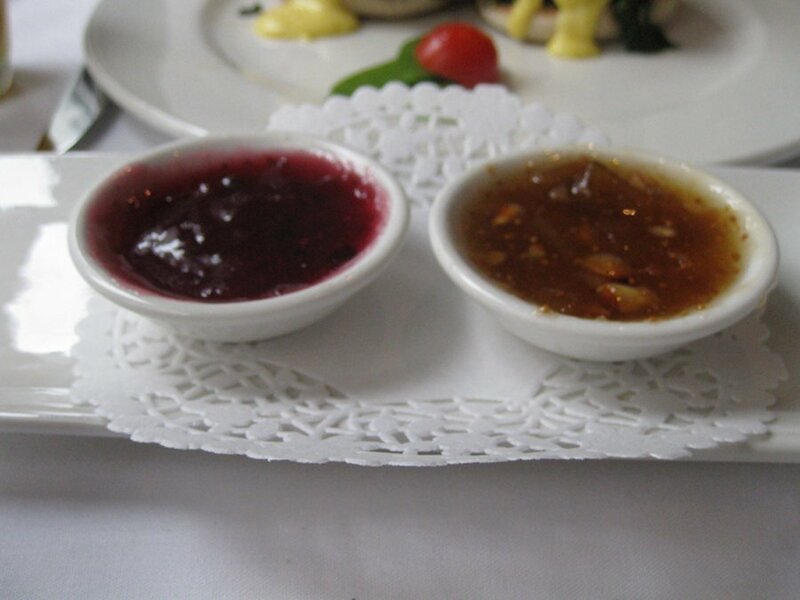 The jam was quite good, I was intrigued with the almond jam which had pieces of almond in it. My friend ended up getting a small orange juice ($5) which was averagely priced for its size. We then opened up with a side of blintzes ($5 for five). If you are not familiar with Blintzes, they are basically tiny pancakes that came with a nice maples syrup. This is a nice little dish to share since it’s fun and kind of cheap consider you get five of them for $5. 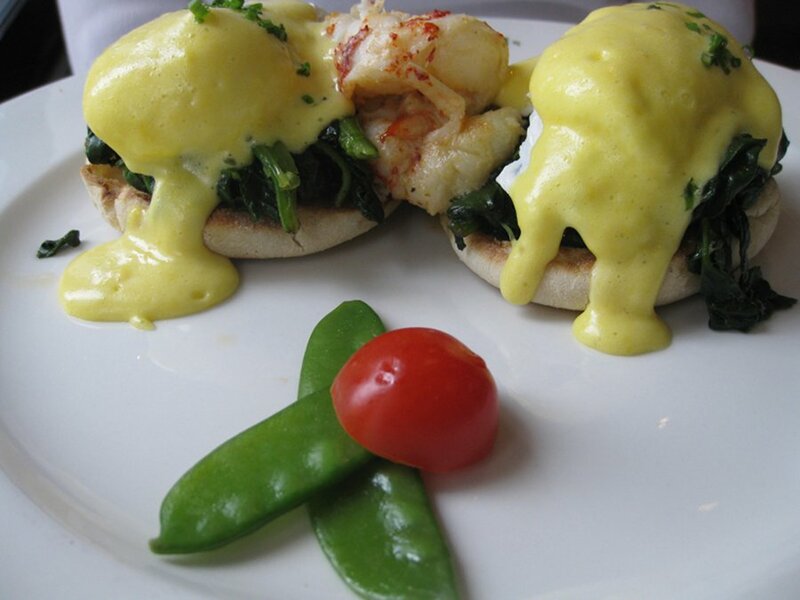 My friend ordered the lobster Benedict ($26) which is two poached eggs on an English muffin, with spinach and a very generous amount of lobster. All this is topped with a yummy hollondaise sauce. Normally, an eggs Benedict will run you anywhere from $12-$15 depending where and what you get. In this case, when you add the lobster variable you can expect the price to go up considerably, and although $26 is expensive you really get a generous amount of lobster chunks, not shredded up like some other places do. The dish was very tasty. If you love lobster and brunch, this is a great dish for you if the price tag does not turn you off. The dish did have some tomatoes and peas on the side. This is more of a window dressing than a real side, so I would have like something more substantial on the side. 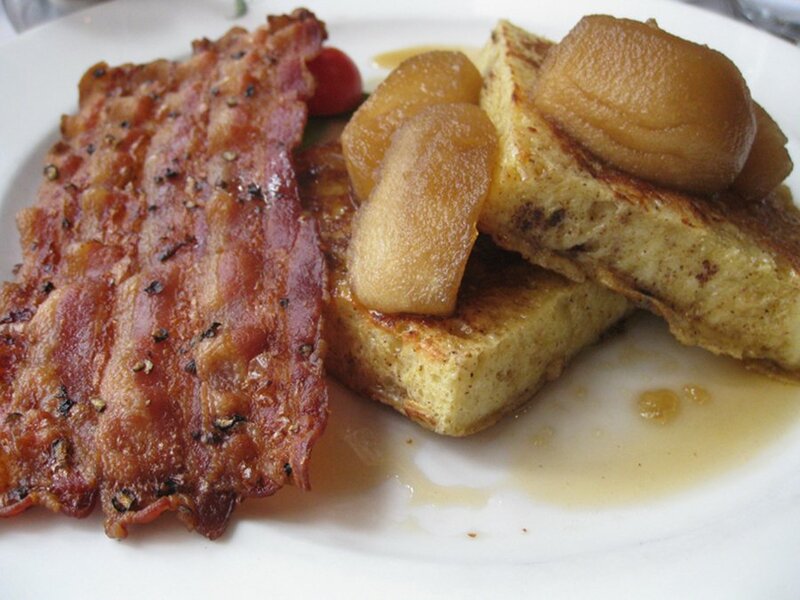 I ordered the French toast Brioche ($15) with two pieces of brioche French toast, topped with apples, maple syrup and a side of bacon. The bacon was one large piece and was crispy; the apples were warm and the brioche bread had a nice spongy consistency while still maintaining its structural integrity and not fall apart. The warm apples were a welcome addition. However, the bacon, I felt, was too crispy and I was annoyed by the fact it seemed to be three slices fused into one. I would have rather had the choice for a sausage or maybe fruits or potatoes. There were also peppercorns on the bacon which did not help the overall bacon situation. Besides that little hiccup, I did love the brioche French toast. In fact, I have rarely had as good a brioche French toast as I had this time. Even with a $15 price tag, it was worth it. Overall, the menu was a touch on the pricey side and you would not expect a classic, eggs bacon and beans dish. But if you are a fan of fancy brunches then this is the place for you. They manage to make brunch fancy while still keeping the dishes brunch-like and not lunch-like. 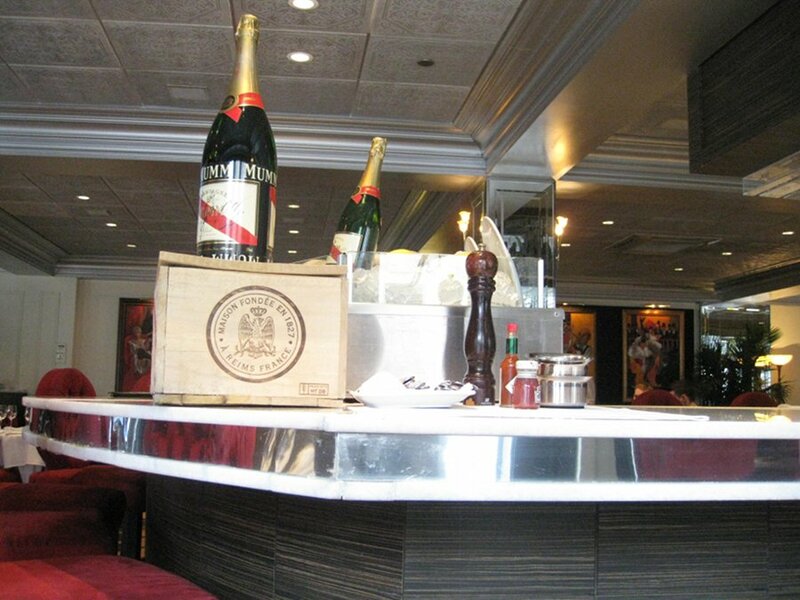 Using variations on French toast, eggs benedict and even steak and eggs, you get a brunch with some pizzaz on it. The price of most dishes is a little more than normal but you do get free coffee and a bread with jam. This coupled with the fact that dishes are tasty and well done you can start to see the value in it. I would still like to see some sides added to the dishes like some fruit and potatoes just to add a little extra. The service was excellent as they checked up on frequently refilled our coffee often and were helpful in explaining some dishes when we were trying to make our decision. Near the end we were not rushed so we were able to sit and relax. Most dishes are vegetarian friendly and if you don’t mind fish it expands your options even more. There are no vegan options since the salads in the lunch menu have fish or cheese in them. I must admit that I had my initial reservations about Le Pois Penché but I was impressed and can see how people will enjoy this especially if you are a fan of fancy brunches. Prices can be a touch high but small things like included coffee and bread add value to the dishes. This place is also great for a group or special event and you can make reservations.